I am getting ready to go on my first shark teeth dive in Venice, Florida next weekend. With the upcoming trip, I thought it might be good to get a handle on what to expect and if possible, search out some of the best ways to get the shark loot. I think it is a cool thing to dig up or find a fossil that may weigh over a pound. I know nothing about shark tooth collecting other than I have done it a few times on the beach when my son was much younger. You can find both fossils and newer teeth. If you are collecting on the beach almost all the sharks’ teeth you find are not actually the teeth themselves but fossils of the teeth. Sharks are constantly losing teeth, and as they do so, a new one moves up to take its place. Sharks have 4 rows of teeth and loose hundreds of them daily. When the lost teeth sink to the bottom of the ocean and becomes buried in sediment, it begins to fossilize. The minerals in the sediment gradually replace the original tooth material. This process takes thousands of years to complete. A general rule is that a fossil is over 10000 years old. Fossilized shark teeth are different colors, depending on the sediment in which they were buried. Most are black and dark grey, while some are brown or tan. Fossilized sharks’ teeth of unusual colors are rare and are more valuable. Sharks’ teeth found in Georgia and Florida range in size from less than a half inch to over six inches. These large teeth are from megaladon sharks and are extremely rare. 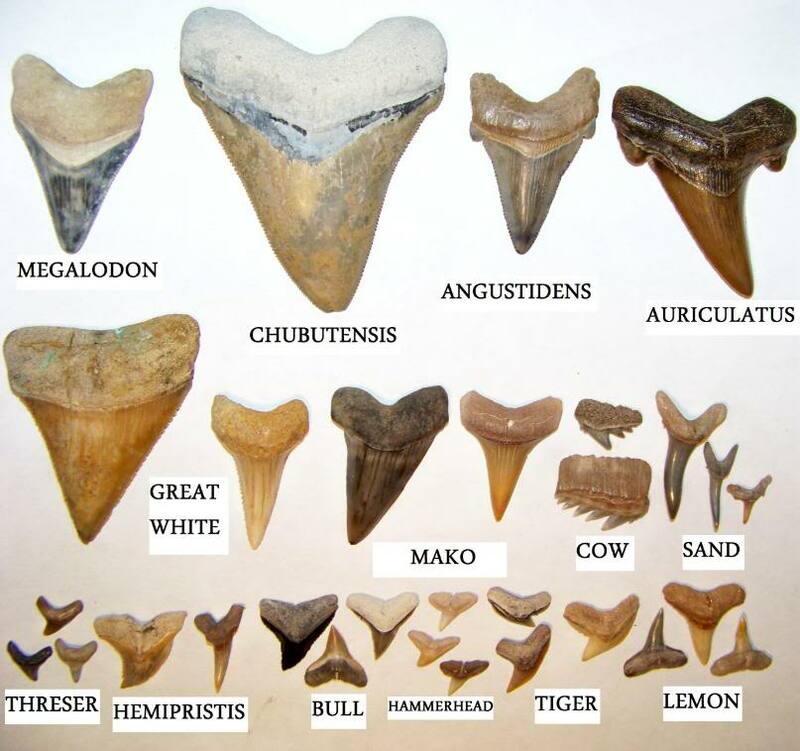 Florida is a hotspot for shark teeth fossils because all of Florida used to be under water. There are no set rules for finding fossilized shark teeth. I can only tell you what I have tried. This is all on the beach. I will post later on diving for shark teeth. Go to the beach at low tide, and look for tide lines – the lines of debris along the beach. Walk the tide lines and look for black triangles. These are the sharks’ teeth. While not all fossilized teeth are exactly triangular in shape, most are. It will take you a bit to train your eye to only see the black objects. You may have sediment and stuff still stuck on the outside so be prepared to clean them later. If there are a lot of shells, scoop up a handful or bucketful and sift through them for teeth. You might want to collect a pail of shells and sit in your lounge chair while you search through them. (or grab a cold frosty one!) I use a metal sifter and literally sift the sand through like flour. Easy for a kid to do and a great way to spend some time with a little friend. Perfect for grandparents too! Another good place to look for sharks’ teeth is at the water’s edge. I found a great mako tooth about 10 years ago just tumbling in the surf line. If you have a lot of competition on the beach, this might be your best chance of finding teeth because you’ll see them before any other collectors have a chance. If any sandbars are visible at low tide, wade out to them. This is often a great place to find the teeth. As you’re walking through the water, feel the bottom with your toes. Sharks teeth and interesting seashells are sometimes trapped between sandbars or between the sandbar and the shoreline. If you’re at a beach that has clear, calm surf, try snorkeling to search for shark teeth. I like to float in shallow water and lightly run my fingers through the sandy bottom. This works awesome on the west coast in Sarasota, Clearwater, St Pete Beach. Be careful of sting rays or flounders in the sand. Many people find that shark teeth are more abundant on the new moon and the full moon because the pull of the tide is stronger. I have no idea if this is true, but I do know that after a storm or high winds, there will be more teeth and more shells in general on the beach. Also, if you can find an area where dredged sand has been added to a beach or near a beach, this is a great place to look for sharks’ teeth. 1. Sharks have been living on Earth for about 400 million years. 2. When a shark dies and its cartilage dissolves, the teeth fall to the bottom of the ocean and get covered with sandy sediment. This sediment prevents oxygen and destructive bacteria from reaching the tooth, and it fossilizes over the course of about 10,000 years. That’s why most of the teeth that are found and collected aren’t white, but gray, black or brown — the color of the sediment. The tooth absorbs the minerals in the sediment and these minerals eventually replace the dentine and enamel that makes up the tooth. 3. Like all other fossils, shark’s teeth can be valuable, so they’re readily bought, sold and traded by enthusiasts and collectors. The most valuable of all is the tooth of the giant megalodon shark. This bad boy was a prehistoric beast that makes the modern great white look like your average goldfish. Great whites these days vary in size from 7 to 20 feet (2 to 6 meters). The prehistoric megalodon may have grown to a whopping 60 feet (18 meters). The tooth of the megalodon ranges in size from 3.5 to 7 inches (89 to 177 mm) in length and can weigh more than a pound (.4 kg). Locating any megalodon tooth is a great find, and anything over 4 inches is rare and valuable. These teeth can go for as much as several thousand dollars each on the auction Web site eBay, depending on the size and the location where it was unearthed. The other factor that determines the value of the tooth is the shape that it’s in. Even though teeth are fairly well ­preserved as fossils, they can be slightly eroded and contain chips and cracks from undersea rocks and coral. 4. Fossil shark teeth date back hundreds of millions of years. The most common, however, are from the Cenozoic Era (65 million years ago to present). I’m going to in a future post after I go on the dive, list some of the types of fossil teeth found and characteristics of them. My understanding is that is is difficult at first to determine the exact species. This entry was posted in Creature Feature, Florida Diving, Sharks, Technical tips, info, or other useful thoughts and tagged beach hunting, coral, fossil shark, reef, sand, scuba diving, shark's teeth, shore, techniques, tips. Bookmark the permalink. thanks. I didn’t get to go as hubby came down with an ear infection really bad. I will keep it in mind for future though. Shoot me your prices and times you go out and I will add it to my book. Also, if you ever have any specials, let me know and I will post them on daniellesdives.com in our special section. least 2 dives and if late afternoon weather permits will do 3 dives…..
up on the net….has a great book out……..we dove this past Sun & Tue…found 20 plus 3″-4.5″ teeth….Current boat is 26 ft ProLine WACC with twin engines. Would like to go sharktooth diving. We are coming to Florida to Anna Marie Island on 8/29-9/5. We are interested in diving for shark teeth but we have 6 people. Can you give me some names of the dive shops in that area that will take us to a great spot. We’re from Okalhoma so coming home with a shark tooth would be an amazing story. I will look into my posts, I have a private guy that does boats for 6. try scubasharkman@yahoo.com I am not sure if he does snorkeling as well. Please tell him Danielle’s dives referred you. Nice, I love hunting for shark teeth in Venice, Florida. Not only are your chances of finding specimens better, but it’s a beautiful and friendly place to visit as well. Good luck to you! Hi, i’ve only got a passing interest in fossils, though i do collect occassional bits and pieces. I just wanted to say thanks because you’ve managed to help me solve a mysery with this particular blog post. I’ve had this necklace for some time with a shark tooth as the center piece, but we’ve never been able to work out which species the tooth is from. It’s not a fossilised tooth, but a much newer one, and it was found at a car boot and the stall owner had no idea either (he thought it was a mako or a greath white, but i already knew that great whites have triangular teeth and we have a mako tooth at home, so i knew it wasn’t that either). It was only when i found this blog by accident that i realised i’m wearing a tiger shark’s tooth around my neck! I found a tooth on Boca grande island/gasporilla area in Florida and it first look like any tooth I’ve seen. Can you help me identify it if I send a picture?! 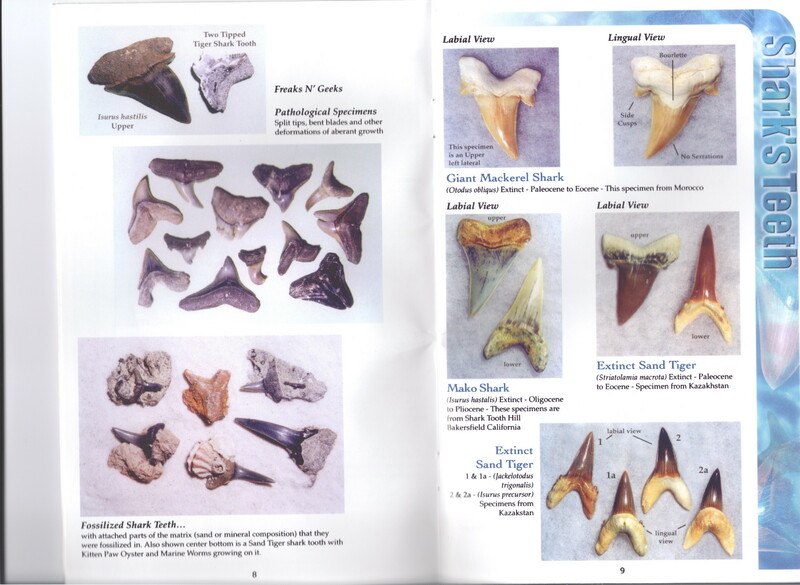 my dads girlfriend had a shark tooth collection and i was looking at it but the tooths she has dont look like any of the ones mentioned on your website? That is an extremely well written article. Do you have a place I can send a pic of a tooth I found they all look the same kinda? Maybe you could identify it for me? And is it ok to wear them as jewelry, what I mean do they need any special care so they won’t be damaged? I am coming to siesta key next week and have been looking forward to finding or hunting for shark’s teeth with my kiddos. I mentioned this to a friend who lives near bradenton area and he said that shark’s teeth are not something you can normally find on these beaches anymore. Is it rare to find them anymore along the shoreline or on the sand bars during low tides? Thanks for all the information! I am an avid collector! I live on the East coast and hunt for teeth in the Myrtle beach and Socaste areas of South Carolina. I just came back from gulf shores Alabama. I found 3 teeth. One is an obvious shark tooth. One I’m pretty sure is a tooth. One looks like a prehistoric tooth or even maybe a claw. Where can I get these identified? How can I send you a picture. I showed them to the guy working on the beach, and he had no idea. He wanted to know himself. I’m dying to know what this is! Thanks so much! Jose and looking for a boat ride . About inch two inches. carcharodon by the looks of it . Awesome. It is so great to see people appreciate the things around them. Happy hunting. Spent the afternoon on Manasota Beach in Englewood, FL Found about 70 or so shark teeth in about 2 hours walking the beach.